One thing that I like a bout the Christmas season is that all the gift packs come out for many of the foreign breweries. This week I picked up a gift pack from Duvel, which featured two Duvels and a Duvel "Tulip" Glass. The Duvel Tulip Glass has been described as "quite possibly the best beer glass known to man". Etched in the bottom of the glass is a small "D" which causes bubbles to form and rise to the top of the glass creating a better head. Duvel claims the tulip shape helps to release the flavour of it's beer. The Moortgat brewery-farm was opened in 1871 by Jan-Léonard Moortgat and his wife. In 1900, Jan's sons joined the brewery with Albert becoming the brewer. During the first world war, Albert had a chance to try English ales, which he really enjoyed and came home wanting to create his own version. After bargaining for some yeast from Scotland, it took five years of trial and error to create the beer of his vision. 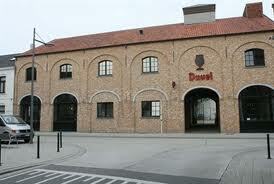 Legend has it that when he finally found success, he declared "This is a real Duvel (Devil)." Thus the name too was founded. The Duvel website claims that this is an all natural beer which still uses the same original recipe. They even describe how to properly pour beer into their tulip glass. "take your time and pour the beer slowly into the glass that is held at a slight angle. Avoid contact between the bottle and the glass and gradually lift the bottle a bit higher to form a full, creamy head. You should also leave approximately 1 cm of beer in the bottle. This contains the yeast which can make the beer somewhat cloudy and bitter. You should also leave approximately 1 cm of beer in the bottle. This contains the yeast which can make the beer somewhat cloudy and bitter." OK, time to do it. I was pretty successful with the pour but may have over poured as there was definitely not one cm left in the bottle. The glass holds much more than just 1 bottle of beer. The beer does pour with a nice white head and is golden in colour, which is what you might expect from a golden ale. Interesting as you c an see the bubbles constantly rising from the small D in the bottom of the glass. It stops working. The beer is very aromatic. I could smell the flavour and the hops. It is a very nice tasting ale. It starts with a slight sourness and ends with a nice hop finish. Not a strong hop presence but you know the hops are there. It is a very drinkable beer but when drinking, one must remember that this is an 8.5% APV ale. Better not to have too many. I only have two so can't have too many but know both bottles will be empty by day's end. More beer excellence coming from Belgium! Look from the middle of the bottom of the glass and you can see a bubble trail rising to the right side of the "U".